The biochemists have their niche in the modern world of inventive cuisine - so it only seems fair to let other areas of science bring in their own particular specialities. 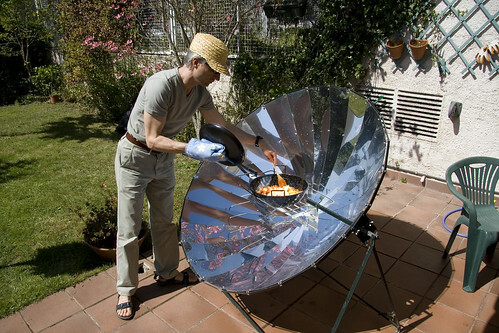 Ok, this is perhaps stretching the analogy a little, but it's still great that we can use the technology of the parabolic mirror to create a fantastic culinary device (and as an amateur collector of kitchenalia from around the world this really appeals to me). The solar cooker is a startlingly simple device, and the interest is not in the technology of the cooking process itself, but more in making a device which can be cheaply manufactured, put together and maintained in a variety of harsh conditions. 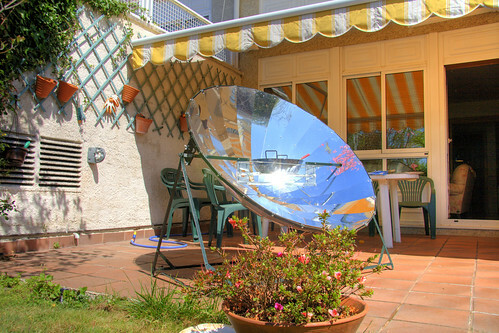 Various models of the solar cooker are already in place in refugee camps around the world, where other access to even the simplest equipment is very difficult to come by and different incarnations of the solar cooker have a variety of uses, including the ability to sterilise water. If you're catering for a large number of people, there's always the option of choosing a slightly larger design! On Saturday I went for lunch at a colleague's house and on top of spending many enjoyable hours with non-English speakers (still contributing little but now understanding most) we cooked up a great Paella on the solar cooker. Temperatures were getting up to 30 degrees and the lack of wind meant that the heat was retained very well. Getting a pan of onions and garlic frying vigorously took perhaps 5-10 minutes and a pot of around 3 litres of water was boiling continuously once up to heat. The total light captured on a good day is equivalent to around 1 Kw, though the efficiency is of course not 100%. 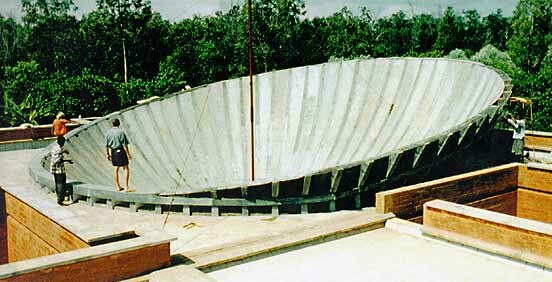 On top of the above equipment (which can be made from cardboard and silver foil (see various designs here) one needs pots and pans painted with matt black paint and a good pair of sunglasses. Anyway, I would highly recommend giving this a go. If I had a garden I'd certainly build one myself. I think the word needs to be spread about this technology as an amazing way of getting sanitisation and portable cooking equipment to the masses of people who need it. (For a couple more photos from Saturday, take a look here). I can smell it now. Going to look into this as it has me intrigued. Hey Duke, glad to hear it's got the juices flowing - Post here and tell me how it goes!